The series has been great fun but for fans of the original Wonder Woman TV series starring Lynda Carter and the Bionic Woman starring Lyndsey Wagner it's been a time machine to what could have been when these two iconic heroines meet. Andy Mangels and Judit Tondora have put together a sprawling crossover event that faithfully captures the tone and aesthetic of the 1970's shows. Often complicated and full of exposition, the camaraderie between Diana and Jamie is genuine and to see them in action makes the cover price worth every penny. Bringing together not only the titular heroes but incorporating their respective supporting characters like Wonder Girl and combining villains was no easy feat but Mangels and Tondora pull it off with enthusiasm and precision. The plot to use Fembots to take control of Paradise Island and exposes its secrets to the world results in a giant clash of warriors. The epic battles involve so many characters that it can seem cluttered at times but Tondora's pencil work is visceral and energetic while Roland Pilcz's colors are bold and vibrant. It's a lot to take in so scanning the panels slowly to absorb all is a must. 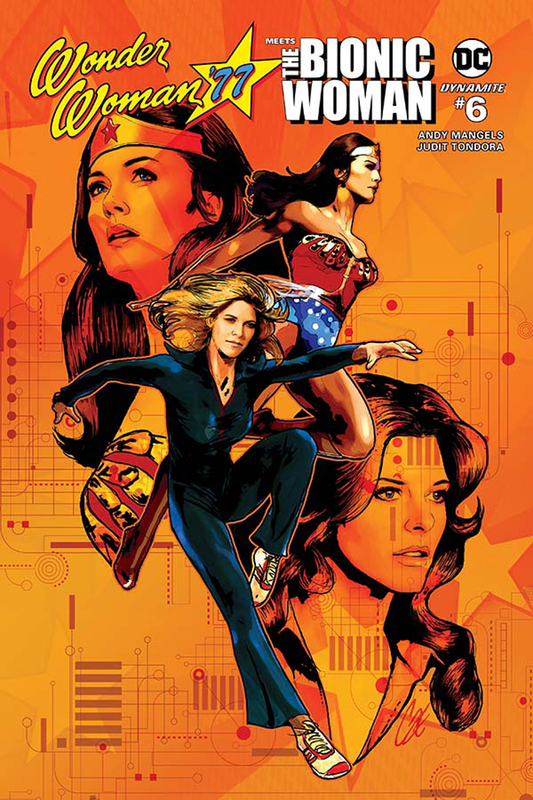 'Wonder Woman '77 Meets The Bionic Woman' is a series that welcomes new readers but really embraces fans of the original shows with a warm blanket of nostalgia. Mangels is just the superfan writer to take us back to 1977 to when these amazing characters ruled genre television. This epic finale pulls out all the stops and delivers a satisfying conclusion.